For folks who want to improve the appearance of their smile, the effectiveness of their bite, and/or their overall oral and dental health, feeling in charge of their orthodontic treatment decisions and feeling prepared for their initial consultation is important. During your initial consultation with Walker Orthodontics, Dr. John Walker will answer your questions about orthodontics and your oral health. 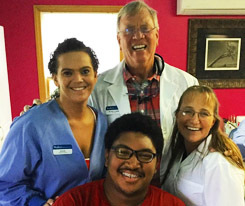 If orthodontic treatment is indicated, Dr. Walker and the team at Walker Orthodontics will then outline a treatment plan that will best treat your orthodontic issues and provide for the utmost treatment outcome. 1. What kinds of treatment options do I have to get straighter teeth and healthier smile? 2. What kind of preparation is needed to get braces? How many visits will the treatment take? It’s always a good idea to ask questions like these to ensure that you’re comfortable with undergoing orthodontic treatment and that it fits conveniently into your schedule and budget. 3. Should I expect any pain while I have braces? A lot of people who could readily benefit from orthodontic treatment shy away from the idea because they fear it might be a painful process. This is a common concern for many patients, and it’s one that you should talk about with your orthodontics provider. The Walker Orthodontics team will explain exactly what to expect and how to treat any discomfort their patients may experience. 4. What determines how long I have to wear braces? 5. How will braces affect my lifestyle, my diet, and my activity level? It’s impossible to avoid having to make changes in your lifestyle, specifically your dietary habits, once you begin orthodontic treatment. You may find that you need to make just a few changes to your daily routine to have a faster and more successful treatment outcome. During your consultation, Dr. Walker will discuss with you any recommended diet or lifestyle changes so that you’ll be prepared and ready by the time your orthodontic treatment begins. • How long will a typical adjustment appointment last? • What are the typical costs associated with orthodontic treatment, and what should you expect to pay? • What orthodontic treatment costs does your insurance plan cover? • Who arranges for insurance company pre-authorizations, if necessary? • Who files the associated insurance forms for treatment? • What flexibility is there to pay any outstanding charges not covered by insurance? Your initial orthodontic consultation is just the first step toward the healthiest smile you can achieve. Be sure to bring a list of your questions for Dr. Walker and the team at Walker Orthodontics near Groton, MA. To schedule an initial consultation with Walker Orthodontics, call: (978) 345-7988.